The struggle between private citizen and the business world is an all too familiar one, where the needs of “progress” often trample on the rights of “the little guy.” More often than not, “progress” wins, with gentrification and so-called “Urban Renewal” being forced upon a population that does not want it, does not benefit from it, and sadly results not in “renewal” but in destruction and urban desolation. Sometimes, though, “the little guy” wins, and Citizen Jane is the story of one such incident. Jane Jacobs was a New York based magazine writer who specialized in architecture and city planning. As a resident of the West Village, she was horrified to learn that real estate mogul Robert Moses had proposed a plan that would extend Fifth Avenue through the heart of Washington Square Park, which would not only destroy a beloved community gathering place but would also uproot and displace hundreds of working class families and businesses in Greenwich Village. It was a plan Moses had been working on for decades, and had been sidetracked thanks to World War Two. In the Fifties, though, Moses revived the idea, and the city of New York took him up on it. Over the next decade, a war of words took place, and Jacobs became a community leader in preserving the area, an often-futile battle that resulted in endless protests, meetings, and community action. One positive result was her 1961 book, The Death And Life of Great American Cities, where she documented the importance of locally maintained communities such as her beloved Greenwich Village, and how modernization in other cities had negatively impacted once great cities, for when the human touch of a community is destroyed, crime goes up, poverty increases, and the quality of life is lowered. Her battle for New York City came to an end in 1968, when she was arrested in a protest and decided to leave New York City, relocating to Toronto. But by then, she had earned her reputation as a crusader and a voice of reason in local community preservation, and she continued to work, write, and help organize other groups; she was still active when she passed away in 2006 at the age of 90. Unfortunately, many of her predictions have come true, and can be evidenced today in Detroit, as well as in Brazil, India, and many, many other cities around the world. 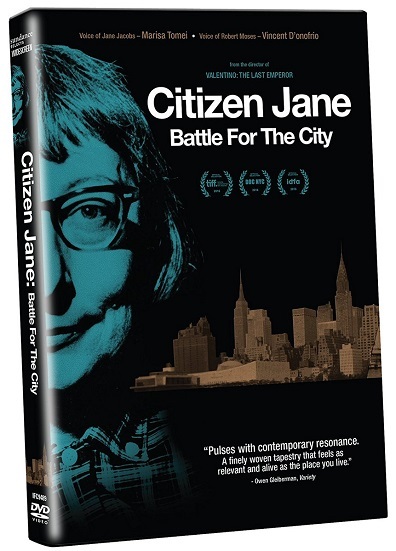 As futile as it might seem to engage in an all-powerful entity, Citizen Jane shows that it is possible to come out victorious—even if said victory is only a Pyrrhic one. The Jane Jacobs book have written so nicely and how the Jane becomes architecture and design great building and architecture designs which become so popular around the world.